I have very fond memories of looking after the old Alpine House at Kew Gardens (built in 1887) in 1980. Apart from the world of alpines, Kew introduced me to tufa gardening, a sub-culture within a gardening sub-culture. I quickly learned to love these minuscule jewels and their need for fresh air, perfect drainage, cool temperatures and protection from hard frost. Watching wild Blue moonwort (Soldanella alpina) flowers warm up so they can melt their way through an insulating blanket of snow for pollination was fascinating. Every day the pick of the most interesting alpines would come out from the Alpine Yards to go on display. For each you wrote an identification label using pen and ink. Fiddly, but then the emphasis was on quality care and detailed attention. Kew’s alpine yards were centres of excellence: high style botanical horticulture under the watchful eyes of Brian Halliwell, the Assistant Curator, a legendary expert gardener and collector. Halliwell travelled and collected worldwide, gaining encyclopaedic knowledge, passion and enormous experience. One weekend, when working overtime, he ticked me off for allowing some Craspedia to wilt , and that was when I discovered his deep affection for Australian alpines, especially Tasmanian ones, was only exceeded by his concern at seeing a wilting plant. Whilst learning about alpines at Kew, I found two classic reference books very handy for cramming: Sanders’ Encyclopaedia of Gardening and the ‘Handbook of Hardy Herbaceous & Alpine Flowers’ by William Sutherland. Sutherland was (in 1871, when he wrote this book) gardener to the Earl of Minto, and previously the Manager of the Herbaceous Department at Kew. Australia has more alpine species than Britain, although these natives are rarely cultivated in Australia. The popularity of alpines has generally declined in England, but their cultivation remains strong in Scotland. The Scottish Rock Garden Club is very active. I spent a fascinating time working at the massive rock garden at Edinburgh Botanic Garden. Edinburgh’s climate, while not ideal, was much better suited to alpines than that of London. This card collection brings back fond, early gardening memories. My paternal grandmother – Winnifred – taught me to garden when I was four. Nan was a keen grower of alpines. At the time, I didn’t realise she cultivated a classic collection of European alpines in our garden, but I did know that they were important to her. Nan grew her alpines in a long, north facing rockery. (You’d never dare use a derogatory term like ‘rockery’ in conversation with Halliwell, to him the only fit home for alpines is a rock garden). Anyway, Grandad (Wilf) built it before the second world war and included his own fake boulders (Wilf’s ‘pulmanite‘) made from broken bricks enclosed with a honey sandstone-coloured render. Where the render broke away, moss used to grow pleasingly well, making the rockery look more natural. In the 1960’s, when I was a very young gardener, I remember helping Nan plant new stock, weeding and dividing the perennials. Unfortunately Nan moved to the country after Grandad died, leaving me in charge of her rockery. Creeping Mind your own business (Soleirolia soleirolii) gradually smothered everything. So out came the alpines while I destroyed this weedy groundcover, cooking it with a flame gun. I reconditioned the soil and started collecting and growing hardy herbaceous ferns instead. It’s only now I’ve photographed the cigarette card collection that I realise Nan had more than half the following fifty species growing in her London rockery. I wonder if this is coincidence, or if her choice had been influenced by Wills’ cigarette cards? 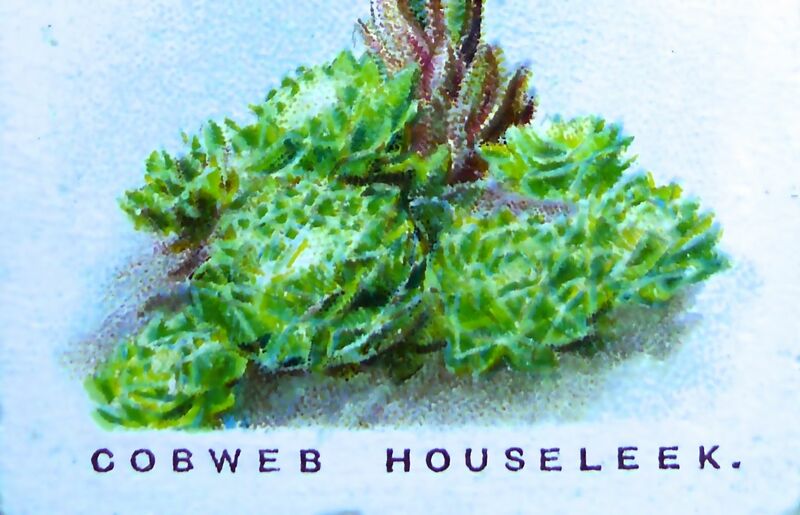 The botanical art and growers notes are wonderful; also, I love that it is the centenary of these cards, and your wry speculation regarding your Nan’s choice. What a collection!